I recently spent three weeks in Cambodia, Laos, and Thailand, on my way to the European DX Council Conference in Finland. Whilst in South Asia, I gained an appreciation of current HF broadcasting in the countries of the region, which continues to show steady decline in favour of more efficient and effective delivery over medium-wave and VHF-FM facilities. This account of Cambodian broadcasting may be of interest, based on my "on-the-ground" monitoring from the region! Kampuchea, Cambodia, Khmer and Ankor are all names associated with a single Asian civilisation renowned for its art and architecture. Kambujadesa or Kambuja is a Sanskrit name for the modern country of Cambodia. The word derives from a tribe in north India and is associated with Kambu Svayambhuva, the legendary founder of the Khmer civilisation. Kampuchea, a modern version of the name, was part of the official title of the country as recently as 1989. European transliterations of Kambuja became Cambodge in French and Cambodia in English, which is the present day name. The modern capital of Cambodia is Phnom Penh (phnom meaning hill), in the south. The inhabitants are Khmers or Cambodians, and in the past the country has also been called Khmer. The correct name of the national language is Khmer (not Cambodian as used by some writers). French is widely understood. The written language dates from the 7th century in a script of Indian origin. Mixtures of Sanskrit, Pali, Thai, Chinese and Vietnamese vocabulary are commonnplace. The Khmer language belongs to the family Mon-Khmer. Other languages within this group include those spoken in Myanmar (Mon), Vietnam, Laos, and parts of Malaysia. The word Kampuchea is frequently heard in identification announcements over Cambodian broadcasters. Cambodia is in the south-west of the Indo-China Peninsula (Indo-China means "between India and China"), of an area of 181,000 sq.km, divided into 18 provinces. It is bordered on the west by Thailand, Laos in the north, and Vietnam in the south and east. It has about 100 km of coastline on the Gulf of Thailand. It has a vast inland lake, known as Tonle Sap, (Great Lake), near Siem Reap. The Mekong River runs through the centre, from Laos to Vietnam. 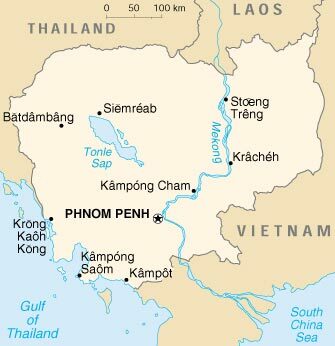 The main towns outside of Phnom Penh are Siem Reap, Battambang, Kompong Cham, and Sihanoukville. The massive urban exodus of 1975-78 under Pol Pot severely depleted the populations of the major towns and cities. In that period, hundreds of thousands of people died from brutal treatment, starvation, and disease. The Khmer Rouge massacred thousands of people at the "killing fields" by torture, hanging, and decapitation, with massive numbers of intellectuals and academics being murdered as the innocent victims of mass genocide. There are some 11,000 km or roads, but only about 2,000 km are surfaced. The telephone system is rudimentary, and virtually non-existent outside of the major cities. The average life expectancy for males is 50, and 52 for females. The Cambodian Radio no longer has a specific external service. Twice each day, a 75 minute service in English, French, Thai, Lao and Vietnamese (15 mins for each language) is broadcast from 0000-0115 and 1200-1315, using the single frequency of 11940. No medium-wave channel could be found for either transmission, even though 1260 kHz is listed in some sources. Commencement time varies, and some days the morning service is the air as early as 2350 (6.50 am local time). These services are intended for foreigners in Cambodia (there is no Khmer segment) and consist mainly of vocal and instrumental contemporary music, generally old Western songs, and modern Thai/Lao/Vietnamese pieces. There are very few announcements. Some transmissions do not have any announcements at all! Modulation quality is terrible, with bad audio distortion, and there is severe frequency drift down to 11937 at times. Signal level is very weak, even in the Phnom Penh area. The morning service experiences severe interference from CRI on 11945. The service is audible in Laos and Thailand, subject to the above constraints, but it is questionable whether an audience actually exists! It would appear that the service was originally only on MW and then extended to SW. There was a frequency of 9695/9693 used many years ago, believed to be from the same technically unstable transmitter. The transmitting site for this service is adjacent to the unsealed bumpy road leading to the Genocidal Memorial and Killing Fields, about 2 km from the centre of Phnom Penh. The site also contains the 200 kW MW txer on 918 kHz, which is a vertical radiator. The site also has several curtain arrays and dipoles, one of which appears to be used for 11940. It is not known what the other arrays are used for, if they are used at all. The 918 kHz mast actually rises from a swamp, and the HF installation is surrounded by a high stone wall, much of it crumbling. The site buildings looked very old and under-maintained. There is very little MW activity in Cambodia. This is confined to a single Government-controlled network, originating from Phnom Penh, on 918 kHz, with 120 kW, 2230-1500. Transmissions open with a religious feature, corresponding to 6.30 am local time. I was unable to find any other MW services broadcasting from the country! From reception locations in Phnom Penh (south) and Siem Reap (west, the MW band is a cacophony of innumerable Vietnamese and Thai stations, both during daytime and evening. Phnom Penh is only 50 km from the Vietnamese border. FM broadcasting is modest, with several private stations in operation in Phnom Penh and Siem Reap. Channel spacing is 0.5 MHz, beginning at 88.0 mHz. Siem Reap is the large town in the west adjacent to the Ankor Wat historical site, where I stayed, and is the centre for visits to the temple complexes. The most well-known temple is Ankor Wat, over 1000 years old. The word Wat means temple. By world standards, radio broadcasting in Cambodia is quite small, and the HF service would appear to be very nearly extinct. Little funding is available for extension of existing facilities, and the country relies heavily on grants and support from other regions. The Australian Government has invested heavily in major infrastructure projects, including bridges and roads, and has also contributed substantial funds for management of conservation and restoration works for the ancient monuments. The historic site of Ankor has been included on the UNESCO World Heritage List of over 400 sites. Additional international aid has been provided by France and Japan. The Royal Government of Cambodia acknowledges the earning potential of the historic monuments as major tourist attractions.